The Skil Reciprocating Saw operates on an 8.5 amp motor. The power tool is speed variable, in which you can alter the speed up to a maximum speed of 2,700 strokes per minute and a minimum of 800 strokes per minute. The operation is comfortable in this reciprocating saw with a two-finger trigger integrated into it. The blade used by the Skil Reciprocating Saw is a 9 inches long Ugly blade. This power tool has a maximum stroke of 1 1/8 inches and a maximum capacity of seven inches for cutting through wood. The set itself is packed with a total of three blades. Apart from the 9 inches long Ugly blade, there are two additional six inches long blades. The entire unit consists of a convenient and safe location for placing the additional blades. The vibration control system in this Reciprocating Saw helps in reducing the number of vibrations, allowing you to gain better control over the power tool. It also reduces your fatigue while carrying out the job. In addition, the handle comes with a soft grip to ensure additional comfort for the user. The design of this Reciprocating Saw is also worth mentioning. The power tool is equipped with a pivoting shoe, which you can adjust as per your comfort. This gives you better control over the machine and an increased stability that comes in handy while doing tough jobs/ the six foot, ten inches long cord of the Skil Reciprocating Saw allows you to maneuver around the work space comfortably without reconnecting it at different plug points. Thus, the Skil Reciprocating Saw is apt for most of the jobs around the house, allowing the average homeowner to carry out moderately difficult cutting jobs. 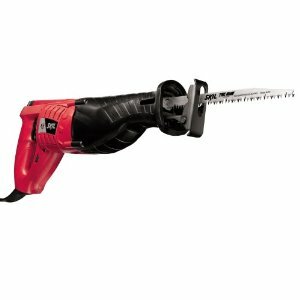 Unlike other competitors in the market, this power tool is a very basic unit. There is an absence of a tool-less blade changing system that is common among its more expensive counterparts. In addition, the variable speed dial also works well, allowing you to change the speed according to necessity of the job. The price is an attractive aspect of the Skil Reciprocating Saw. It is priced at a low range compared to its other competitors, at less than $60. It comes with a two year warranty. 	Cord Length: 6' 10"
The simplicity and the comfort provided by this Reciprocating Saw allow it to be used for easy to moderately tough jobs at home. Its variable speed control ensures that you use the right speed for the right jobs. Finally, the price of the Skil Reciprocating Saw is lower than other saws from different companies, making it an attractive buy. The in-built storage is device for additional blades is an added advantage. While the simplicity of the Skil Reciprocating Saw can be seen as an upside, there is a downside to it as well. It does not have as much features as its competitors, and the lack of a tool-less blade changing mechanism can be really felt. This Reciprocating Saw is a simple and cheap tool for all the usual work at home. Although it does seem comfortable to use, its lack of features mean that you are restricted in your work. If you want a cheap reciprocating saw for some small jobs at home though, it is perfect. Return From Skil Reciprocating Saw Page to Home - finishcarpentryhelp.